Congratulations to Gail Beardsley, our 2015 Captain’s Cup Winner for the 9-hole group. 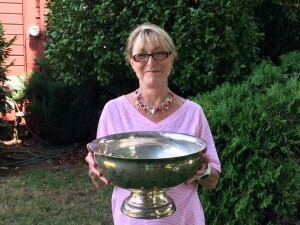 Gail claimed this year’s cup with 2 great rounds of 34 & 32 for a net 66 total. Second place went to Sandy Osterholt with a net 69 (36-33), followed by Delores Spindler & Dorothy Stone, tied for third with net 70’s. Nice Shooting, Ladies – Congratulations to all the winners.